Most middle-aged and older people are busy managing full-time jobs and families, leaving less time for getting physically fit. The aging process often takes a toll on our bodies and energy levels, making hitting the gym far tougher than when we were in our teens and twenties. And while these factors are understandable explanations for not getting enough exercise later in life, they don’t eliminate this one basic truth: even older adults need regular physical exercise. The TRUTH: None of this is true. While aging does tend to make exercise more difficult than it was when someone was in their teens or twenties, it doesn’t make physical activity impossible. And the benefits are nearly endless: regular exercise can improve one’s physical appearance, helping them feel more confident; it can help limit the chances of developing serious health problems, such as heart disease; and, as it does with younger people, it can limit the negative impact of mental health conditions like anxiety and depression. Some older people refuse to engage in physical activity because they worry it will lead to a serious injury that could leave them immobile and dependent on others for their care. And while those risks exist — just as they do for younger people playing sports like football, hockey, or baseball — there’s no guarantee that participating in physical activity will leave one with a serious physical injury. The TRUTH: In fact, regular exercise is more likely to benefit your health by helping you to improve your physical endurance. An adult who regularly participates in some kind of physical activity is more likely to have the strength and flexibility to avoid becoming injured and may be in a better position to recover should they suffer any kind of physical setback. Some people avoid exercise because their doctor has advised against physical activity. Others simply speculate that their physician would say this without actually asking the question. They’re two very different situations, with the former usually reserved for individuals recovering from serious physical health problems, like major surgery. 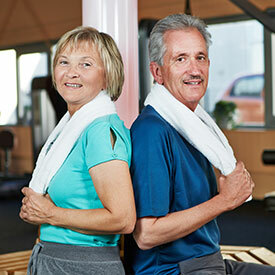 The TRUTH: In reality, just about anyone, no matter their age, can benefit from some form of physical exercise. If you’re an older adult with sore knees or a sore back, it makes sense to avoid intense physical activities like hockey or football. But that doesn’t mean you won’t benefit from something more moderate, like cycling, swimming, or walking around the neighborhood. If you’re not sure how your physician would react to these ideas, try asking them in person. Engaging in physical exercise when you’re not feeling well can be difficult, even impossible. We all have an idea of how we should feel before participating in physical activities. If we start doing something before reaching that place, the activity can actually make us feel a lot worse. But sometimes we underestimate ourselves. Sometimes we assume that exercising will only make us feel worse, and not better. The TRUTH: In reality, physical exercise can do a whole lot more for our minds and bodies than burn some fat and a few calories. It can cause the brain to release endorphins that physically make us feel better and give us an edge on anxiety and depression. And it can build our endurance, making us feel capable of taking on challenges, both mental and physical, that we might not have felt up to before. If you’re not well, that’s fine, but consider talking to your doctor about the kind of physical exercise that might help you feel better. As we age, our major organs tend to become somewhat more susceptible to problems. Years of consuming alcohol can take their toll on a liver. Years of smoking can have a huge impact on the lungs. And a life of being overweight, obese, or just sedentary can hurt the heart. In time, these can lead to serious health problems, like liver cancer, emphysema, and heart disease. Some people spend their childhoods and teenage years regularly participating in sports and other forms of physical activity. Others, for whatever reason do not — perhaps they had a physical illness, perhaps they simply weren’t interested in sports or physical exercise. For those in the latter camp, it can be hard to ever start being physical; often, the perception is that you can’t start exercising once you reach middle age. The TRUTH: That, of course, is rarely true. Starting to get physical exercise at a later age may require an individual work a little harder to get into the groove, but it certainly doesn’t make it impossible. Those who have a sparse history of physical exercise should consider working with a personal trainer or knowledgeable friend to learn the fundamentals of the activity they’re interested in, while having a frank conversation with their family doctor about any health risks. But they shouldn’t rule out getting exercise altogether; as they say, better late than never. Arthritis is no laughing matter and it can make movement of any kind very painful for those who regularly experience its impact on the bones and joints. For those with particularly severe cases of arthritis and joint pain, many forms of physical activity will prove difficult to carry out unless medications are used to help manage the discomfort. The TRUTH: But that doesn’t mean individuals with arthritis should rule out trying any form of physical exercise. In fact, there have been a number of studies showing that regular, moderate exercise can be a huge help in alleviating the pain associated with arthritis because it can improve joint functionality by building up the muscles and tissue surrounding them. Middle-aged and older adults are hardly the only people who cite time constraints as a reason for struggling to get sufficient physical exercise. Just about everyone uses this excuse and often it’s completely valid. Busy jobs and families mean it can be really tough to find the time for any extra activities, including exercise. The TRUTH: But that doesn’t mean you shouldn’t make a special effort to get at least some physical exercise. For most adults, the recommended amount per week is 150 minutes — or about 20 to 25 minutes per day. You might also try to prolong your workouts and have them four days each week — in this case, you’d need to get about 35 minutes of exercise in during each session. All told, that’s not a lot of time and the benefits are certainly worth it. Failing to get sufficient physical exercise can leave one in a vicious cycle. They feel lethargic, so they refuse to get exercise, which means they don’t work towards releasing the endorphins and building the muscles that help improve one’s overall energy levels. It’s a cycle that can be very, very difficult to break out of. The TRUTH: That’s why it’s important to make a special effort to get some exercise, even if it’s for a short time — such as 20 minutes each day — and if it’s moderate or casual, like going for a short walk or taking the stairs instead of the elevator. You’d be surprised how these simple steps can make a big change in your energy levels and how you feel about yourself. There’s no denying that individuals with disabilities face obstacles that others do not. Depending on the nature of the disability, it can make even simple acts — such as walking a few blocks or driving to and from work — far more challenging than it would be otherwise. And that means physical exercise can present even more daunting problems. The TRUTH: That said, there’s no shortage of resources available to help individuals with a disability get the physical activity they need to feel healthy and happy. Your family doctor can put you in touch with physiotherapists who can help provide you with an exercise regimen that meets your unique needs and helps you overcome the challenges presented by your particular disability. A gym membership is about as vital to getting sufficient physical exercise as a flying license is to reaching a far-off destination. You don’t need a gym membership to be physically active, just as you don’t need to be able to fly a plane in order to visit your relatives across the country. The TRUTH: In reality, while some people will benefit from having access to the equipment and programs offered by a gym, it’s really very easy for an adult to exercise without a gym membership. You can run, bike, or walk outside on nice days. When it’s rainy or cold, you can stay inside and do a wide range of activities that require nothing but your own body, like push-ups, sit-ups, squats, lunges — the list goes on. Some older adults feel unwelcome in gyms and recreational sports leagues because they’re outnumbered by younger people. And that’s understandable: it’s always a bit intimidating to try and join a group of people who aren’t your age; just ask young people starting their careers at established companies with lots of experienced employees and managers. The TRUTH: But this age differential doesn’t have to stand in the way. Most young people have no issue with older people being at their gym or on their recreational sports team, which means it’s really down to the older adult to move past this mental obstacle themselves. If that’s simply too much to overcome, many communities have recreational activities that are made for older members.